Barcelona, Spain, April 15, 2019 --(PR.com)-- The Pan's Club vegetarian restaurant is an expert in preparing various vegetarian meals. They will be launching the flexi-vegetarian style food Quiche relished with unique taste and health. Quiches are packed with nutritious ingredients like egg, milk, cream, cheese, vegetables, etc. These ingredients are organic and freshly delivered. The Pan's Club was established in June 2015 with a mission to offer healthy and fresh organic food to customers. The restaurant crowns the legacy for having this unique food menu crafted by the notable French Chef Chloe Saada. Over the years, the restaurant has established its reputation entitling it as the most authentic vegetarian restaurant in Barcelona. Many acclaimed actors, celebrities and influential personalities already visited The Pan's Club and left with a wow! 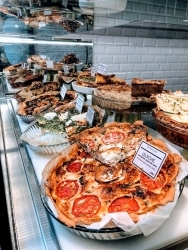 Other than their super-food Quiche, the restaurant's menu offers an extensive variety of nutritious snacks for breakfast, brunch and lunch. You get salads, a variety of pastries, cookies, brownies and smoothies. They additionally offer a free pick up service. Quiche is supercharged with all healthy and nutritional ingredients inside it. It has egg, cream, cheese, and vegetables. Meat, fish or seafood are used as optional toppings for which it becomes a flexi-vegetarian food. It is, therefore, a powerhouse of nutrients and proteins. Quiche goes best with morning breakfast or brunch and lunch as great filler. Moreover, the ingredients used are all organic and received from local farms. Prices started just at €3.90, a slice of quiche gives a power pack of nutrients worthier than its basic cost. This new product launch is scheduled on April 26th, 2019, 12 PM at The Pan's Club, Plaça de la Llana, 16, 08 003 Barcelona. Chloé Saada will be launching this unique product, and the restaurant will be elegantly decorated to greet the guests. They expect the customers to enjoy every bite of this flex-vegetarian food relished with complete nutrients. The CEO of The Pan's Club says this unique product would definitely excite customers as it is full of taste and health. Hailed by the critics, there is no doubt that the new Quiches at The Pan's Club remain the best as they have the best ability in cooking this recipe. They prepare the Quiche with fresh organic vegetables to add more nutrients to the diet. It is definitely anticipated that once a customer tastes this dish, they are going to come again thereby increasing the restaurant's sale. The restaurant offers a unique and energizing space for guests serving them authentic healthy food in a pleasant environment.